The primary responsibility of the Warm-Up Ring Steward is to keep track of all competitors when they enter and exit your warm-up arena. Your other main purpose is to be able to answer questions as needed. Check your supply bin for an extra program and map. That way, competitors, parents, trainers, spectators, and grooms can locate the information, or you can direct them to the day sheets in front of the secretary’s office. You have the most difficult ring to track as riders do not have to warm-up in the main warm-up area, although most do. If there are open, unused ring areas, you may find competitors migrating there to warm-up. Nevertheless, your task is to try to know what horses are in your area in case a competition ring steward is looking for one. You will be given a clipboard, pen, ruler, clock, program, map, and day sheets. If one is available, you will be given a walkie-talkie. If possible, on the appropriate sheet, place a check mark next to the riders’ numbers as they enter the warm-up area. When the competitor leaves the ring, draw a line through their number and name. If the competitor is going to compete in the Equitation Class, instruct them to go to the on-deck area 20 minutes prior to their class, to continue their warm-up there. 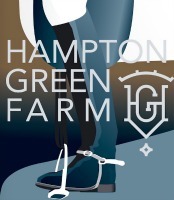 Riders should warm-up in the main warm-up area until they are on deck [the next group to go], at which point they should proceed to the equitation ring’s on -deck area. Again this is approximately 20 minutes prior to their stated ride time. Dressage test competitors should remain in the main warm-up area until approx. 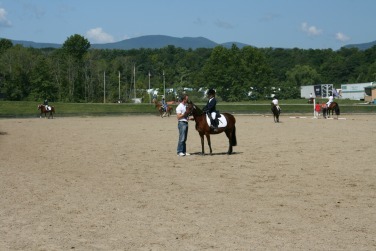 10-15 minutes before their ride time [2-3 rides], then proceed to their dressage ring’s warm-up area. For Rings 1, 2, 3, they will go under the bridge where they will find a small warm-up area. For Rings 4 and 5, they will go out the main pathway to a small warm-up area across from Rings 4 and 5 behind the announcer’s stand. Do not drive yourself crazy chasing horses and numbers; it is the competitor’s responsibility to be in the appropriate ring at the correct time. It is helpful to read the YDF prize list rules in order to be familiar with the specifics of the show. At LYDF one rule is that jackets are not mandatory. Another is that it is the rider’s (not the steward’s) responsibility to ensure that the rider enters the ring on time. Score boards are generally located outside the secrtetary’s office, sometimes under a tent. The scoreboards have the day sheets and the final scores posted. Ribbons and class tests can be picked up at the awards table.